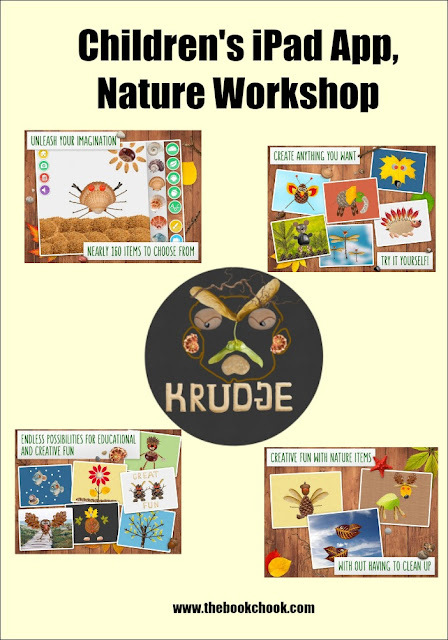 Nature Workshop - Creative Crafts for Kids comes from the same developers who created Puppet Workshop. I was pleased to find another app that encourages kids to create, this time to build an image from items like virtual sticks, pebbles, shells, seeds, leaves etc. Navigation is simple and obvious, with a menu at the side containing the different elements to create with, and a bar at the top showing functions that allow you to edit each element. You can move them easily with a finger, but also increase/decrease their size, as well as rotate them via this same editing bar. Very young kids might find this a little fiddly at first, but they’ll soon get the hang of it with parental guidance. I thought the inclusion of letters and numbers was great. You can see an example of letters in the picture of Krudge I created with the app, in the middle of the larger image, above. I really hope kids go on from the app to create art with things they collect from the natural world. Because you can save an image to the camera roll, the app might also be a great way to create characters for their stories, and kids could add their creations to a comic editor too. While the developers say the app suits kids of all ages, I think older kids may quickly get bored with it. However, if you’re looking for something that encourages your children under 10 to play with picture building, I believe it may well suit. I'll be adding this app to my list: Creating with Kids and iPad Apps.